“One year ago we showed the pilot here and in what was one of the most stressful days of my entire life. But it went well, thank God. And we’re back, ” said SXSW Featured Speaker Seth Rogen. In this SXSW 2017 session moderated by Terri Schwartz, Executive Producers Seth Rogen, Sam Catlin and Garth Ennis discuss the making of AMC’s supernatural drama Preacher, based on the popular comic book, including directing the series’ action-packed scenes and closely adapting the show from the comics in season two, which debuts Monday, June 25 at 10pm ET/9pm CT.
Rogen has emerged as a prominent figure in a new generation of multi-hyphenates, as an actor, writer, producer and director with the ability to generate copious material. 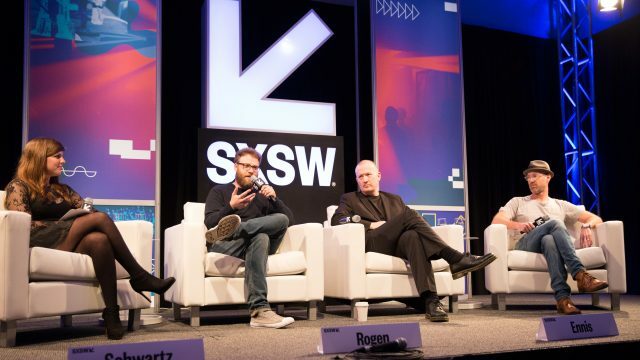 Rogen has often said that he loves SXSW as it it the only festival that takes comedy seriously. He has had many other projects premiere at the SXSW Film Festival including Observe and Report (2009), Neighbors (2014), Sausage Party (2016), plus The Disaster Artist which was wildly popular at this year’s festival. We remain big fans of his work, comedic or dramatic, and look forward to sharing it with our audiences in the years to come. As for Preacher’s other collaborators, Caitlin had several producing roles and writing credits in AMC’s, Breaking Bad. Ennis is the creator of the comic book which Preacher is based on and has written several other popular comics that have been adapted for the big screen including Punisher and Ghost Rider. Photo courtesy of Joel Pena.